I think that those of you who read the 'News, Rumour & Gossip' section here will be in little doubt as to my views on this topic! In a nutshell I detest it! I know that there is a school of thought that considers Graffiti to be a form of art and perhaps it is, providing it's displayed on property with the permission of the owner; I know too that some local authorities allow certain pieces of their property to be 'decorated' in this way, with the hope of deterring unauthorised adornment I presume - I have to say I have mixed feelings about even this, but these are my personal views and not relevant to the purpose of this page. However, there is certainly no consent given by London Underground (or any of its partners) to the vandalism of its property. It costs London Underground (and by definition its fare paying passengers) millions of pounds each year. 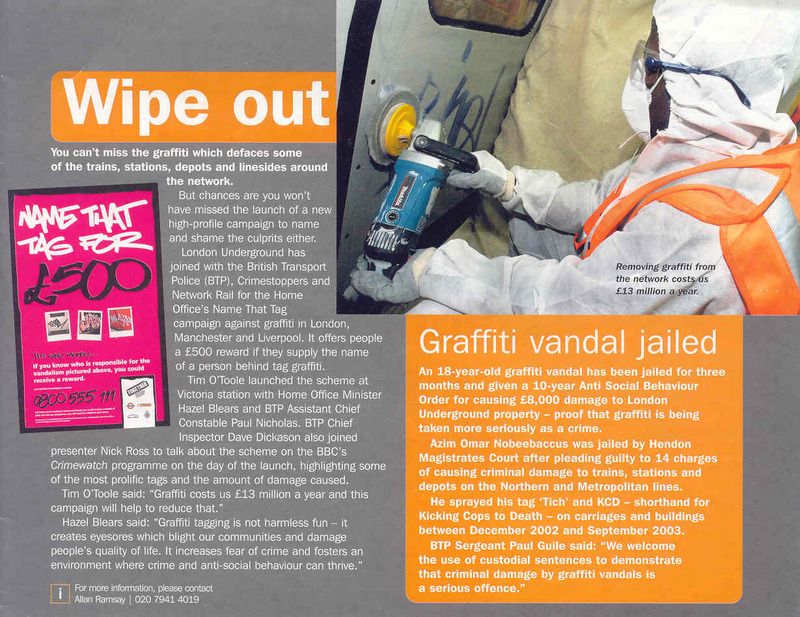 'Our Managing Director, Tim O'Toole, has made his hatred of graffiti abundantly clear, and clear plans and targets are being put in place as far as the trains are concerned - there are significant moves being put in place for an extensive clean up and improved materials are being phased in to maintain the resulting improvement. In that brief piece I made reference to two things that have caused me start this section. The first of this are the words 'significant moves' and I'll return to this point later. The second is the determination of our Managing Director to address the problem with vigour! 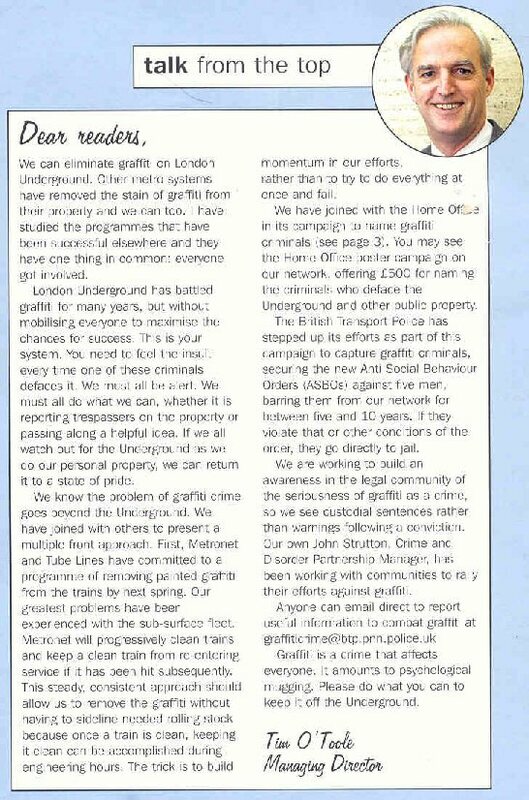 On this latter point, the following items are reproduced from London Underground's staff magazine 'On the Move' from the January 2004 edition; I'm sure the editorial staff there will have no objections to them being shared with a wider audience! As I've had to shrink the scan I took of the item the reproduction above isn't too great, I'm afraid, so if you have difficulty reading it click on the image to view the full size version. I was impressed by both the positive wording - in particular the expression towards the end of the piece 'It amounts to psychological mugging', the determination it displays and the strategy it outlines. Again, the image is 'clickable' to enable you to view the full size article. In the piece above Tim O'Toole outlined that 'We have joined with others to present a multiple front approach'. By chance I happened to be at my home depot on a morning in early March 2004 when the man who's taken on the task of Contracts Manager for the company which is now providing security services for the sidings and depots for the Sub-Surface Railways called in as he wished to take a trip in a cab to view the area between Acton Town and Ealing Broadway; this is an area where there are a high proportion of graffiti attacks. As I was available at the time, I gave him the trip and pointed out a few areas where I either knew that attacks had happened or that I considered to be 'vulnerable' to such trespass. It was an interesting trip - I was very interested to learn the steps which had already been put in place in a very short period of time and learnt much about the approach that he and his company are taking to tackle the problem. Incidentally it's his belief (and having now had a chance to view some more of the tags concerned I agree) that the latest spate of 'TOXIC' tags is not being done by the individual 'himself'. 'He' apparently is now the subject of an Antisocial Behaviour Order (ASBO) and should he breach this then he'll 'go down'. I wonder if it's a rival 'firm' trying to point the finger at him! On our return to Acton Town we continued our discussion and I have given him my commitment that I'll do all that I can to bring to his attention any matters that may help him and his team in the programme. He's particularly interested in trying to piece together the individuals who make up particular 'firms' and also any new tags that are spotted as I travel around the system. I often carry my camera with me, so I'm sure this will get put to good use, conditions allowing of course! He also gave me quite an insight into not only the more robust steps being introduced in the way patrolling of the sites will be done but also details of some of the technological systems that are being put in place. I'm not going to go into details here, just in case any of the more 'antisocial elements' are browsing this page but, suffice it to say if you're contemplating the idea of taking up graffitying London Underground property I'd suggest you think again! Obviously the reporting lines that are outlined above are open to you, and if you do know of anyone that's involved in the activity I'd urge you to use those avenues. I know that many of you travel extensively across the system, often armed with cameras. If you do see any new tags that you haven't seen before please photograph them. I now have a 'direct line' to the company dealing with the problem and I'm more than happy to act as a 'clearing house' for the purpose. Go outside areas available to the public. If a member of staff requests that you stop taking photographs providing you are sticking to these guidelines politely request that he or she speaks to his or her supervisor so that they can be made aware of the regulations on this subject! Please bear in mind though, particularly at times of 'heightened security' that the request to stop photographing may be driven by genuine concerns. If this is the case I would strongly recommend that you comply with the request. They may also wonder why you're taking photos of graffiti tags - as you may be aware the taggers themselves often photograph their 'work'! I'd suggest that you politely explain why you're taking such photos, but if they continue to be suspicious don't run the risk of antagonising 'authority'! Mail me the details of the location and so on and I'll pass the details along the line. Don't just limit yourself to the Sub-Surface Lines - my contact will be grateful for information from anywhere across the system. But in closing I'd say the following; I will NOT be reproducing any photos that either I take myself or that are sent to me here - there's no way that I want to have any association to anything that publicises the tags. Also if you do not wish me to pass on any details of who's sent the images to me I will respect your wishes. Let's all try to really make a difference on this! I'm pleased to be able to add a few comments to this section, and all are on a positive note. Firstly, as you may have read on the 'parent' page to this, is the news that the individual who tags himself 'TOX' was indeed apprehended in the course of his activities so, as he is already the subject of an ASBO, this should mean that he will be taken out of circulation on the grounds of the breach of this order. I hope that when he is brought before the courts no leniency will be shown; in my view he should be made an example of and the penalties imposed on him should be as draconian as the law allows! I do not propose going into details of the 'how' that this arrest was achieved - it would be inappropriate for me to do so - but (as I suggest above) it was a combination of increased vigilance and the use of technology. The arrest did cause a bit of disruption to the line involved at the start of traffic that morning, but is this not a price worth paying if it means that the problem is to be seriously addressed? I know that such delays can cause inconvenience to passengers, but I'm sure that, if the reasons are properly communicated, they will understand the situation. In the last couple of weeks I've certainly started to note the efforts being made to improve the 'ambience' of both our rolling stock and stations. The former are now showing signs of the 'deep clean' programme - not only are there very few trains now out showing signs of recently applied graffiti to the bodywork (both internally and externally) but also the area below the bodies, the 'sole bar', which is a part often tagged but less frequently cleaned, have also been receiving close attention. Certainly I've noticed this on both the C and D Stocks and will be interested to see the efforts being made on other lines when I have a chance to get around the network. I've also noticed that several stations (Hammersmith, Chiswick Park and Stamford Brook spring immediately to mind) have been receiving attention. Several parts of these stations had been quite badly affected, and in the last few weeks large areas have been cleaned and repainted to remove evidence of the attacks they've sustained. Both these matters are I think good news. Certainly the efforts improve my working environment but, more importantly, I hope the efforts are noticed and appreciated by LU's customers and that they too see the positive improvements. Of course, this does not mean the problem has been solved - I'm sure it hasn't been. But let's hope that the vandals realise that attacks are not being tolerated and that a real reduction is achieved. I'm certainly still keeping my eyes open for new attacks! As it has been a while since I last updated this section, I thought it would be interesting to review the progress of the last few months. There seems to be no doubt that the efforts of the British Transport Police and the courts in dealing severely with those apprehended for carrying out this vandalism continues. London Underground's web site details a number of instances of convictions and sentences over recent months. Certainly my perception is that the situation has improved. Although trains are still occasionally attacked they are cleaned and returned to service very quickly. A number of stations have been deep cleaned and new attacks are, again, dealt with promptly. Also - and I think this is most encouraging - parts of the open sections of the railway which have often been a target have been cleaned and the walls and other infrastructure painted. This seems to be an ongoing project too, and almost daily I see new areas which have been dealt with in this way. Of course, some places which have received this attention have been re-attacked, but, again, these fresh attacks are removed or over painted in a very short time. I hope this continues. So, all in all, this multifaceted approach seems to be bearing fruit. London Underground's web site reports news that a graffiti vandal has been successfully sued in the Civil Courts for repayment towards the damage he has caused. This is great news, and I hope an approach that will be pursued in the future. It will be interesting to see whether there are any similar retrospective claims against those who have been similarly convicted. The full press release on the matter can be read here.